Digital disruption is gaining impetus across industries and it is evident IoT or the Internet of Things would be a major contributor to it. 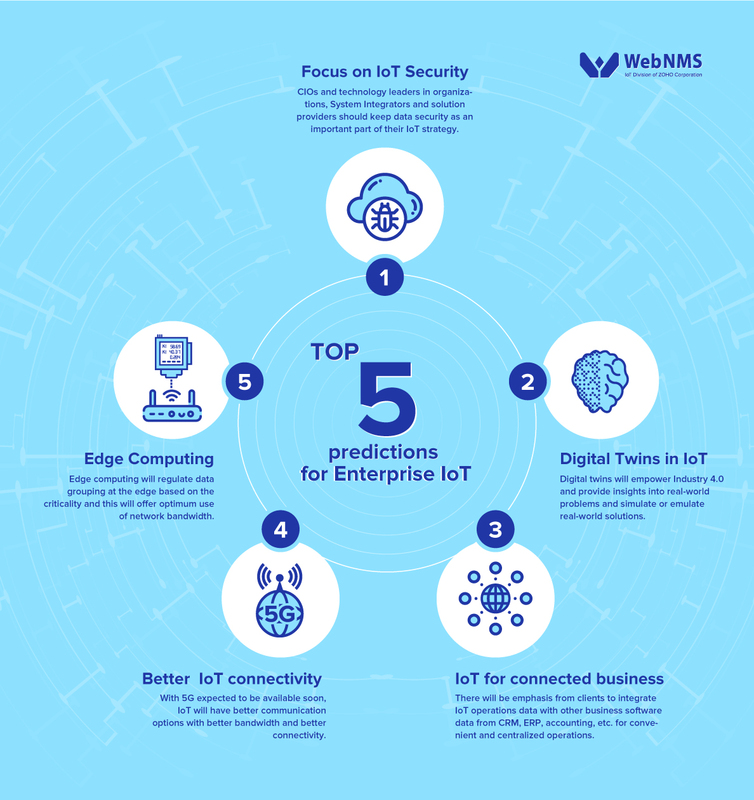 The article discusses the trends that IoT vendors, customers and solution providers should look for in 2019. IoT has moved from being in the hype cycle to a place where it can demonstrate a clear value proposition to the customer. From a phase where IoT was mostly proof of concepts in many organizations, now the trend is moving to definite projects and implementation. Hence the coming year will see more concrete steps from organizations in terms of planning, engaging and deploying IoT based solutions. 2018 saw a greater focus on data privacy and emphasis on how organizations handle customer’s personal information. As more and more devices are getting connected from wearables to personal devices and innumerable connected assets join the network of devices, the key focus ahead would be to ensure that these devices, their communication and the data is secure. Data breach, hacks and data piracy pose a potential threat to an organization’s intellectual property. It will take a strong regulations/standards to streamline movement of data between data nodes and the cloud. IoT software and hardware players would strengthen the security aspect of their products. CIOs and technology leaders in organizations, System Integrators and solution providers should keep data security as an important part of their IoT strategy. Individual assets getting connected has its benefits, however a larger context is set when these assets create a digital world of connected devices where each device/node is not independent but works in tandem with other devices and factors. Even the connected vehicles is one such arena where the changes in one asset could impact the other assets around it. Digital twins will expand to emulate this behavior and provide insight into real-world problems and simulate or emulate real-world solutions. They will help improve the efficiency of real world assets. . Machine learning and AI will then be able to make sense of this cohesive data and evolve interactive models that can predict failures and enable proactive measures. Focus on data processing closer home: There will be emphasis on processing the data closer to the device – meaning more of Edge computing can be expected in 2019. The need to have things done faster on the IoT network calls for a provision to achieve actions with minimum latency and bandwidth. Edge computing will regulate data grouping at the edge based on the criticality and this will offer optimum use of network bandwidth. Moreover, with many enterprise operations adopting IoT solutions to their existing BMS, facilities, SCADA and other operations framework, Edge helps in integrating data driven actions. Edge computing will be preferred for IoT deployments in order to combat connectivity issues and deal with unexpected latency. Expect Edge computing focus both at the hardware and the software layer in 2019. The idea of replacing data silos in an enterprise with unified data operations will get stronger this year. There will be emphasis from clients to integrate IoT operations data with other business software data from CRM, ERP, accounting, etc. for convenient and centralized operations. The integrated and unified data management will offer more visibility and clarity to the management, while making strategic decisions. It can provide ways to use the data to create new business models, monetize it, make asset purchase decisions and take any enterprise wide actions based on the data. This trend of IoT data transcending beyond operations rooms and creating data driven management will become the trend of 2019. With 5G expected to be available soon, IoT will have better communication options with better bandwidth and better connectivity. While various connectivity options like LoRa, SigFox, GSM, NB-IoT, etc. will each compete for a larger market share, the infrastructure readiness and ubiquitous availability of connectivity at optimal cost will determine the adoption. 2019 will see the emergence of clear vertical focus in various domains and use cases, whose specific needs will determine the best fit among these competing technologies. A key takeaway for CEOs and decision makers would be to evolve a solid IoT strategy for your organization and build the human capital for implementing it, as IoT is here to stay and is already disrupting business models and the way organizations function and deliver their services.